Specialist Lifting Solutions provides the broadest range of specialist crane solutions for the strictest demands of today’s working environments. 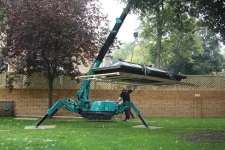 Specialist Lifting Solutions offers a specialist Lift and Shift service using a range of mini crawler cranes. Through using mini crawler cranes Specialist Lifting Solutions can offer balance, workability and maneuverability to an otherwise problematic relocation. Like the name suggests the mini crawler cranes are able to navigate round small spaces with both accuracy and ease. Specialist Lifting Solutions are trained experts at using and moving items with mini crawler cranes, and together with our other specialist equipment (such as our Powermate stair climbers) we are able to provide practical solutions to almost all logistical challenges. The MC285 Mini crane is capable of lifting up to 2.85 tonnes and has a total boom length of 8.5 meters. Due to small access points of the rear garden the MC285 was the ideal machine to complete the project. 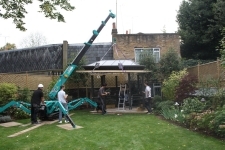 This is Specialist Lifting Solutions Lift and Shift using its heavy lifting equipment to maneuver a gazebo roof into its final position. 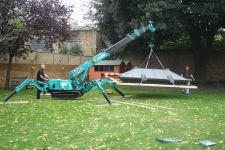 The relocation of this item was in central London, the advantage of using smaller cranes enabled us to work without disrupting traffic or the local neighborhood.